I was hoping to write more frequently so this post is really just a summary of the main things I have been doing since we took ownership of the wood in December. One of my first priorities was to make sure there were no public safety issues so I contacted UPM Tilhill and asked them to do a tree safety survey. On January 4th Stephen Taylor made a site visit where he inspected the trees adjacent to the road, the disused mill stream which defines the southwest boundary and Restricted Byway 98 where it passes through the wood. The inspection cost £500 plus VAT and I received a comprehensive report. 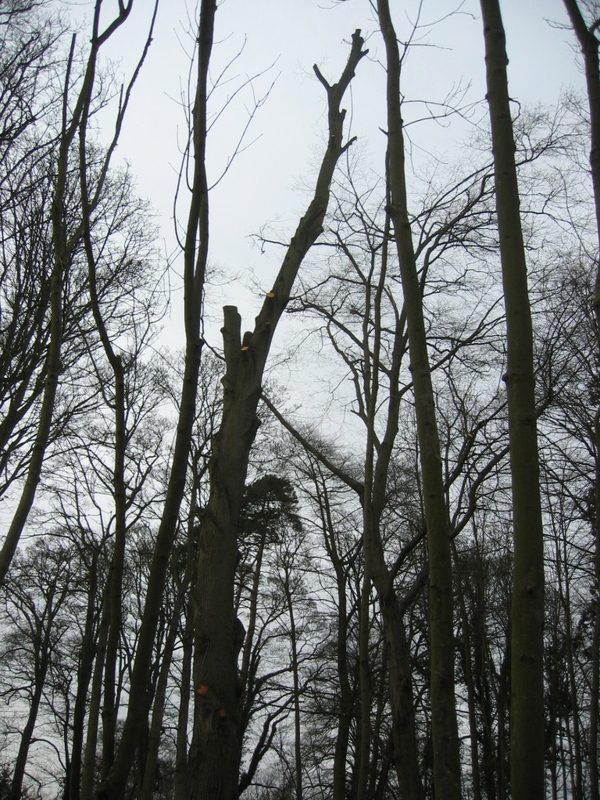 The only significant problem was with a mature lime tree next to the road with serious basal decay for which Stephen recommended felling within three months to prevent collapse onto the road. It was actually three months before I received an invoice for the survey – apparently the delay was due to having to wait for head office in Finland to set up my customer account. Once my account was set up Tilhill were also able to provide me with Growing Timber Insurance including public liability insurance for only $100 plus Insurance Premium Tax (I thought that was for a year but for some reason the period of insurance is only seven months). So I had to get a large lime tree felled and since it was covered by the 1981 area TPO I had to apply to East Herts District Council for consent, which was granted within a week. I had done some work fitting out a van for an arborist friend and he agreed to fell the tree for me in exchange, which we scheduled for March 3rd. Apparently the lime is our tallest native tree and this was a fairly large example. We decided not to take it down to ground level but to leave it as a sort of “monolith”. Even so, with Dean up the tree and three people on the ground we didn’t have time to finish the job. Enough weight has come off to make it safe for now but we will go back to take it down to somewhere a bit below the main fork. I mentioned Restricted Byway 98 which enters the wood off the road at the north end of the bridge across the mill stream. It then runs in a fairly straight line up the hill for about 140 m before crossing our boundary into another plot of woodland. This byway divides the wood into two separate areas, each of which was surrounded by a chicken wire fence that was presumably erected in the early eighties to try to keep rabbits off the newly planted trees. The area north of the byway (the north lot) forms a triangle adjacent to the road and is about 1 ha, while the south lot is more rectangular and about double the area. Much of the fencing had fallen into disrepair and was clearly not keeping rabbits out so I decided to remove the lengths on either side of the byway. I also put in a couple of new 6 inch square oak posts at the top end, so for people walking through it is starting to look better already. The byway is used a lot by walkers and fairly regularly by cyclists. I have seen hoof prints a couple of times but although horse drawn carriages are permitted on restricted byways the entrance off the road is only about 120 cm wide. So why is it a restricted byway? Well before that it was apparently classified as a Road Used as a Public Path and as I understand it RUPPs were automatically converted to restricted byways relatively recently. So why was it a RUPP? On the 1923 Ordnance Survey map it is shown as a footpath and someone did apparently query the status back in 1999. I think it should probably be re-classified as a bridleway so it could still be used by walkers, cyclists and horse riders, but not by horse drawn carriages which can’t use it anyway due to the narrow entrance. I may peruse this with Rights of Way but realistically that could take years. I expect the Forestry Commission will advise me to carry out fairly extensive thinning and for that I will really need to be able to get a vehicle into the wood. We own up to the edge of the road and have the right to use it for access so we just need to make a gap in the fence leading to an area of hardstanding and erect a gate. Since it is not a public road this should not pose a problem – hopefully! I believe it will come under “permitted development” but I have been advised to inform the council of my plans. The other thing I am looking at is getting the land registered on the Rural Land Register which is run by the Rural Payments Agency. This is a prerequisite for making grant applications under the English Woodland Grant Scheme (a useful one at the moment would be the Woodland Planning Grant but it is only available for woodlands over 3 ha and ours is just on the limit). I have started the process by registering myself with the RPA to get a Single Business Identifier (SBI) and have got as far as getting a County Parish Holding number (CPH). I now have to fill in form RLE 1 and send it back with a map showing the boundaries to get the land mapped on their database. We have been taking various friends and relatives to look round and it is great seeing everything come to life. There were a few clumps of snowdrops and daffodils mainly near the road, but surprisingly few brambles for an unmanaged wood. On the other hand there are some fairly large areas of bracken, which is just starting to come up. There are also a lot of nettles in some areas – not nice for walking through but good for wildlife (and soup apparently). I first saw the wood in July so I haven’t seen it at this time of year before. Some of the large cherry trees are in blossom and I am looking to seeing how things change over the next few months. Noticed the wood was being managed recently while on a walk.Then just happened upon this web site.Glad it’s going to get some TLC. as enjoy a regular walk through it.Keep up the good work. I haven’t done a lot yet but it is nice to see that my efforts have been noticed. I hope to get a lot more done this year.